When people think of the tropics, palm trees are usually one of the first things to come to mind! There are plenty of palms that can grow in zone 7 climates. The Pindo Palm (Butia capitata) is a cold hardy variety that is a great addition to the home tropical landscape! The Pindo is native to the south eastern region of South America. It can grow up to 20 feet tall with about an 18 inch thick trunk, but it is a very slow grower. Each leaf can be up to 10 feet long, so make sure to leave space for it to fill out! One fantastic feature of this palm is it bears edible fruit! The clusters of yellow fruits appear in the summer, and create quite a mess if not harvested. They are tart and sweet and contain a fair amount of pectin, making them a natural candidate for jelly (in fact this palm is also know as the jelly palm). Each palm produces both male and female flowers, so only one palm is needed for pollination. Like yuccas, this palm can tolerate poor soils and droughts, provided it is well watered until established. The soil should be well drained to prevent root rot. A slow release fertilizer can be applied in the spring and summer. 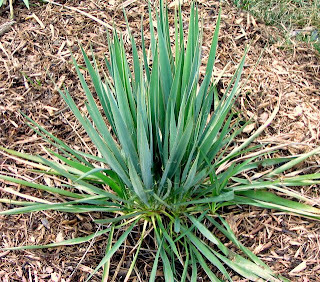 The pindo prefers soils that are slightly acidic, so don't lime the soil by the palm if you apply lime to your lawn. Try to remove a leaf only if it is dead, cut above the base and make sure to wear gloves! The bigger the palm is, the easier it will winter, while it is small protect the base of the tree with loose leaf litter or straw, making sure there is some air flow to prevent rot. If you have a larger tree and there is a blizzard or severe cold snap, wrap burlap around the trunk to protect it, but be sure to remove it once the event is over. There is no need to remove the leaves for winter. The pindo palm is a great plant that looks like the tropics, and with fruit that can taste like it too! 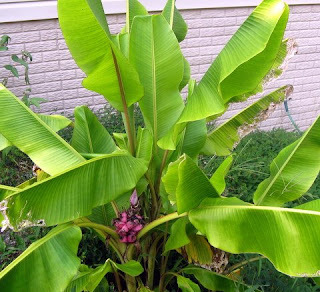 It's not too late to winterize bananas! If your life is like mine, you have so many things going on at once that before you know it there's snow on the ground and your plants are covered in it! Not to fear, as long as the ground has not froze hard down to the roots, cold hardy bananas should be fine! 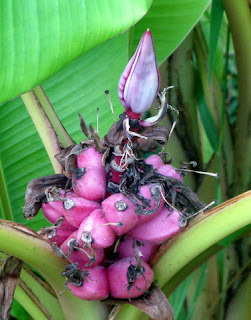 Today I finally winterized my pink velvet banana and expect it to start shooting up stalks in the spring. It's been a long time since a banana update! Wow, it has been a very long time since I updated this blog! 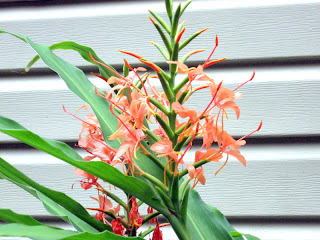 So far, my tropicals have not grown as fast as they have in previous years due to the long, cool spring. 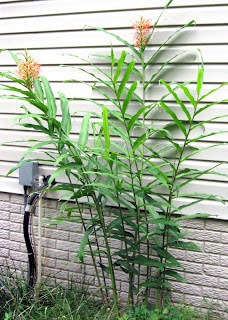 The tropicals I have discussed in this blog do quite well in a Virginia climate, but as a general rule; the more heat they have, the more they will grow! Despite the cool start to the year, my hibiscus has done very well and just bloomed for the first time last week (six blooms at once, last year it was one at a time!) and the velvet pink banana has taken off like a rocket! Unfortunately, Japanese beetles have taken a liking to my banana plants and did quite a bit of leaf damage before I sprayed (I use pesticides if there is a heavy infestation). 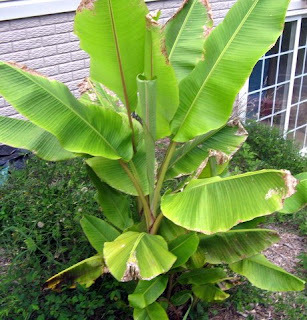 Bananas are so fast growing the damaged leaf area is quickly replaced by new growth, so the plant will recover quite quickly from a beetle attack. You can trim the damaged leaf area off for aesthetics. Here's a pic of the banana!